We often think of funerals and memorial services as opportunities to honor our loved ones, but quite often these services are a time for healing and acceptance, and can prove to be a vital part of the grieving process. Services provide an outlet for our emotions and help us to come to terms with our loss, as well as provide us with the opportunity to connect with family and friends, all of whom may also be in need of support. Every culture and religion has its own sympathy practices and traditions for mourning, which is important to remember when attending a memorial service or funeral for someone outside of your own ethnicity or religious faith. Learning and understanding proper sympathy etiquette will help you to better express your sympathy and ensure that your thoughts and well wishes reach grieving friends and family members. It's also important to remember that each service or ceremony is as unique as the individual whose life it celebrates, and often the deceased's personality will shine through, regardless of religious practices or ethnic background. Etiquette for expressing sympathy varies from family to family. Depending on the family, the circumstances, as well as the funeral or service type, it may be appropriate to send flowers or gifts to the funeral home or directly to the home of the bereaved. In most cases, it's not necessary to send flowers right away, as the family of the deceased will be receiving an abundance of flowers in the days leading up to the funeral or memorial service. Waiting until the initial shock of death has faded to send expressions of sympathy may be a wise choice as it's never too late to offer your condolences and continued support. Below is a helpful guide to the various types of funerals and memorial services, each with its unique sympathy etiquette. This will offer guidance if you're unsure of the deceased's ethnic or religious background, or the type of service that is to be held in their behalf. Location: Funeral Home/Funeral Home Chapels. Traditional wakes or visitation hours are most often held at the funeral home itself, or infrequently, at the home of the deceased or immediate family member. Most commonly referred to as a viewing or wake, this type of service gives friends and loved ones an opportunity to say one last goodbye to the deceased, as well as provides mourners a chance to offer support to one another. Visitation hours are most often held a few days before the funeral service and typically last a few hours. Location: Religious Place of Worship: (e.g. church, synagogue, temple). It is common for funeral services to be held first at the funeral home and then later, at a church or place of worship, where a full or condensed religious service is performed. These types of services are most frequently held early in the morning and are attended by immediate family members and close friends. Following the service attendees will typically drive in a procession to the cemetery or burial site, but this is not always the case. Oftentimes a funeral home or church staff will take on the responsibility of transporting flowers from the funeral service to the gravesite. Location: Cemetery/Cemetery Chapel/Gravesite. There are cases when a memorial service will be conducted at the site of internment, while at other times a funeral procession from a church or place of service will arrive at the gravesite following a ceremony. In both cases the burial site is the location of the final service where a prayer or military honor may be preformed. Following the funeral service, the deceased is either interred or their ashes scattered on site, or given to the family. Cremation is a common practice in which the deceased's body is reduced to ashes by means of a burning ritual. Cremation is generally carried out in a crematorium furnace or crematory fire and is an alternative to burial or the funeral rite of burial. Cremations often have viewing hours and funeral services prior to the scattering of the ashes or receiving of the ashes by the deceased's family. 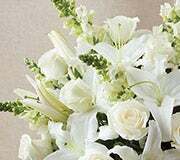 Regardless of if the deceased is buried or cremated, sending flowers is proper sympathy etiquette. In the case that a cremation is held with a traditional funeral service, an open casket viewing may or may not be held. In either case, flowers and sympathy etiquette will be the same as with a traditional funeral service which includes internment. Often a memorial service will have a cremation urn as well as flowers, photos, and other mementos of the deceased, on display. It's best to determine whether or not an urn will be included in the memorial service so that you might work with the funeral director to design the appropriate floral arrangement for that particular display and service. What to Send: Cremation wreaths are specially designed to decorate an urn or framed photo. Such arrangements are typically ordered by the family in lieu of a casket spray. Appropriate expressions to send to a cremation memorial service are standing sprays,floor and fireside baskets, as well as vase arrangements and potted plants. In the case of a direct cremation, families will sometimes forego holding a funeral service or memorial service. Oftentimes, the immediate family will have a floral arrangement specially designed to display with the urn. Even if there happens to be no planned funeral or memorial service, it's still appropriate to send an expression of your sympathy to the home of the bereaved. What to Send: Gourmet sympathy baskets, potted funeral plants, vase arrangements, memorial trees, and small tokens of remembrance are all appropriate expressions of sympathy, and can be sent to the home of the deceased at any time, regardless of whether or not services are being held. Location: Funeral home, family's home, park, restaurant, beach, or any location chosen by the immediate family as a place to congregate for last respects to be paid and the individual's life celebrated. The purpose of a life celebration is just as the name suggests— to honor and celebrate the life of the deceased. These unique memorials are tailored to the specific interests of the individual being celebrated, and may include special music, food or a special activity that reflects the deceased's personality. What to Send: In the unique circumstance of a life celebration, expressions should reflect the individual in some way. This may include an arrangement made up of their favorite flower and can be traditional ( Lilies in a Vase ) or more celebratory (Happy Hour bouquet ). Either way, your expression should be one of meaning and reflect your unique relationship to the deceased. A military funeral is often performed if the deceased was a member the armed forces. 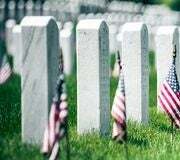 The specific rituals performed are often reflective of the deceased's rank, whether or not he or she was on active duty when he or she passed, as well as which branch they served in. Gun salutes, drumming, and the draping of a nation's flag over the coffin are the common military funeral honors you're likely to experience. It's important to note that funeral flowers are never laid on top of the flag, nor will you see flowers on a casket covered by the flag. Instead, you'll find standing arrangements and baskets as the most appropriate expression for military funeral services. What to Send: It's appropriate to send traditional standing sprays , floor or standing baskets , standing wreaths, fireside baskets, as well as red, white, and blue floral arrangements. Location: Generally funeral home or religious institution. Just as members of the armed forces are often given special funeral rites, public servants, such as police officers and firefighters, are also granted unique honors for their funeral or memorial service. Members of the police academy receive a 21-gun salute as a traditional way of honoring the deceased's service to the community. However, the family may choose not to carry out certain traditions. There are also unique procedures carried out for line-of-duty deaths for both police and firefighters that may include the appointment of a liaison who will act as a point of contact between the bereaved and the police or fire department. Elaborate funeral processions are also common in the case of a line-of-duty death, and many members of the department will arrive to the funeral or memorial services in full uniform. What to Send: Standing arrangements such as sprays, wreaths, and floor baskets are appropriate expressions to send. Often personal tributes in the form of a shield may also be a way of conveying sympathy as well as honoring the deceased's service to the community. Location: Outdoors at family's request As an alternative to a traditional funeral, the deceased's family may choose to hold a green funeral or burial. This funeral alternative seeks out new, natural ways to perform a burial that use fewer resources, leave less of an imprint on the environment, and require less funds. Green burials are often chosen to promote and extend the deceased's values and concerns about the environment. These natural burials help to conserve both land and resources, as well as reduce the use of harmful chemicals used in embalming processes. What to Send: In the unique case of a green burial, it's appropriate to send a meaningful expression to the home of the bereaved. Memorial trees , live plants, and fruit baskets are all excellent choices for expressing your sympathy, and support the natural lifestyle promoted by green burials. Location: At a funeral home or alternate setting. Animal lovers will often hold memorial services for a cherished pet, especially for those they may have had for a while. While pet memorials are rarely as extensive as those conducted for humans, expressions of sympathy are always welcome. What to Send: Small vase arrangements , a potted plant, memorial , stepping-stones, or books are appropriate expressions of sympathy. Location: Home of the deceased or immediate family member. Home burials are an alternative to traditional funerals that continue to increase in popularity, along with the green movement. Many times, home burials are carried out with the guidance of a funeral director, who will oversee all aspects of the burial, and make sure all state regulations for burial are met. Home burials are often chosen as an alternative means of internment because they tend to be much less expensive than traditional burial, and are a way to keep the body of a loved one close to home. What to Send: Vase arrangements , flower baskets, and standing sprays are appropriate expressions of sympathy and can be sent to the home of the bereaved at any time. Location: Determined by the family of the deceased. Private funeral or memorial services are typically smaller than traditional services. Private services are closed to the general public, and only those who are directly invited may attend. While there are many circumstances under which a family may opt to hold a private service, some might include infant deaths, victims of crime, or celebrity deaths. Oftentimes, extreme emotional shock may prevent a family from opening services up to the public. Private services may also be held to reduce cost and keep the ceremony simple and intimate. What to Send: Standing Sprays , vase arrangements , plants , suits the individual and the grieving family. Location: Determined by the family of the deceased. Alternative funeral services have increased in popularity over the years as a movement to “take back death” and restore the intimacy between the living and the dead. Rather than leaving everything in the hands of a funeral director, many have chosen to take care of it themselves. Often, this means family members will help wash and dress the body of their deceased loved one, build a casket, or plan a memorial service. By spending such an intimate amount of time with the deceased's body, the bereaved are given a chance to say goodbye and may come to terms with their loved one's death sooner than if they left these duties to someone else.